Warren’s memory doesn’t seem to be very good. I don’t think I’d want him as my doctor. Well, and for other reasons too. Thanks! I had fun with the vote incentive! I kind of hope Warren is joking here. ‘Cause he seems super dumb. hahahaha, this is my favorite page yet. i mean, there aren’t any zebra cakes, but, its still good. Yeah, no Zebra cakes. You know I only put those in for you anyway. Haha, yeah. I really like the Christmas tree ones too. I almost put those in the comic instead of the Zebra ones, but it seemed too seasonal… I mean it’s April in the comic, gotta keep my accuracy. Thanks! <3 The silly pages like this are the most fun to do. xD Dear lord Warren what kind of girls have you been seeing! Willie would be one awesome zombie! I don’t even think Warren has a very good idea of the kind of girls he’s been seeing. Willie tried a direct approach with Warren. Didn’t really seem to work in his favor. Thanks! The next page should be pretty fun too! A snapshot from the past, eh? I always liked the classic chocolate tube/vanilla filler creme combo myself. Yeah, I like the classic chocolate tubes with cream too. In fact, I kind of like all of the Little Debbie line of products. It was hard to go zebra. LOL. Warren doesn’t want that to be true, but he knows it could be a possibility. hahah are you kidding me if I were a girl I’d love to have Warren as my doctor. Yeah, I think I see your point. Heh. He’s pretty much my favorite character too. Although, I shouldn’t play favorites… he’s just a lot of fun to write. XD I almost fell out of my chair. 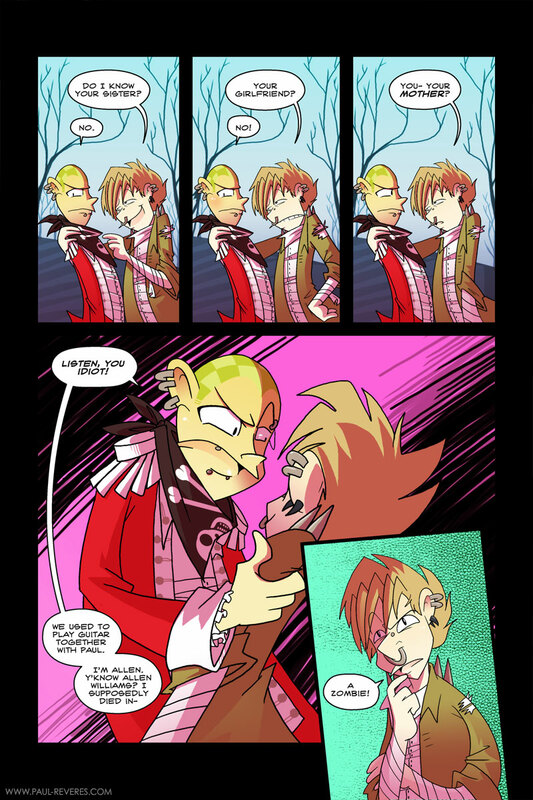 And I adore the vote incentive. Paul is just tooo cute X3. Lol @ Warren! Love the expression in panel 3, haha.